A root canal treatment is a common procedure performed by dentists and endodontists (specialists for inner tooth problems). If you're about to undergo this tooth-saving procedure, here's what you need to know. The goal of a root canal treatment is to stop tooth decay within a tooth's interior and minimize any damage to the tooth and underlying bone. This is done by accessing the tooth's pulp and root canals (tiny passageways traveling through the tooth roots to the bone) by drilling into the biting surface of a back tooth or the "tongue" side of a front tooth. First, though, we numb the tooth and surrounding area with local anesthesia so you won't feel any pain during the procedure. We'll also place a small sheet of vinyl or rubber called a dental dam that isolates the affected tooth from other teeth to minimize the spread of infection. After gaining access inside the tooth we use special instruments to remove all of the diseased tissue, often with the help of a dental microscope to view the interior of tiny root canals. Once the pulp and root canals have been cleared, we'll flush the empty spaces with an antibacterial solution. After any required reshaping, we'll fill the pulp chamber and root canals with a special filling called gutta-percha. This rubberlike, biocompatible substance conforms easily to the shape of these inner tooth structures. 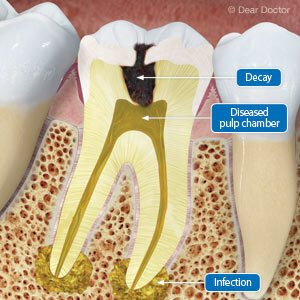 The filling preserves the tooth from future infection, with the added protection of adhesive cement to seal it in. Afterward, you may have a few days of soreness that's often manageable with mild pain relievers. You'll return for a follow-up visit and possibly a more permanent filling for the access hole. It's also likely you'll receive a permanent crown for the tooth to restore it and further protect it from future fracture. Without this vital treatment, you could very well lose your tooth to the ravages of decay. The time and any minor discomfort you may experience are well worth the outcome. The braces are finally off! But to keep your new, straighter smile you'll need to wear a retainer for some time. That's because the same structural mechanism used to move your teeth could undo what we've just accomplished. That mechanism resides in an elastic tissue called the periodontal ligament that lies between the teeth and the bone and attaches to both with tiny fibers. While the ligament holds the teeth securely in place, it also allows for slight movement in response to bite changes. Braces "pull" the teeth in the desired new direction, and the ligament responds. But with that pressure gone after the braces' removal, a kind of "muscle memory" can set in that moves the teeth back towards their original positions. A retainer, a dental appliance worn on the teeth, exerts just enough pressure to "retain" or keep the teeth from regressing. Retainers are effective, but the most common type has a feature that poses potential problems: it can be removed by the wearer. Because of this, less disciplined patients might be tempted not to wear their retainer as directed. There's also a higher risk of losing one and incurring additional cost to replace it. But there is another type, the bonded retainer, which stays permanently in the mouth until removed by an orthodontist. It's composed of a thin piece of metal that's firmly attached to the back of the teeth with dental composite material. 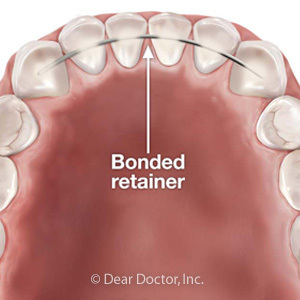 Not only does a bonded retainer solve the problems mentioned before, it also can't be seen from the outside like a removable retainer. A bonded retainer does have one disadvantage: because it can't be removed, it can obstruct the teeth during brushing and flossing and require more effort. You won't have as much difficulty with a removable retainer keeping teeth and gums clean. You can overcome this disadvantage, though, with specialized tools like a water flosser or a floss threader to make hygiene easier. To choose which type of retainer is best for you or your family member, have a talk with your orthodontist. And if you choose a bonded retainer and later have it removed, be sure to switch immediately to a removable one if your orthodontist advises. With either retainer, you'll be able to preserve that hard-earned smile for years to come. While orthodontists can effectively correct most poor bites (malocclusions), some can be quite complex requiring much time and expense. But there's good news—we often don't have to wait on a malocclusion to fully develop if we catch it in time. Thanks to interceptive orthodontics, we may be able to intervene much earlier and eliminate or reduce the degree of difficulty with treatment. Interceptive orthodontics is a group of techniques and devices used in early childhood to help deter a possible malocclusion. Here are 3 ways this approach could make a difference in your child's bite development. Guiding jaw growth. On a normal-sized upper jaw, the permanent teeth usually have ample room to erupt. Not so with a smaller jaw: incoming teeth become crowded and may erupt out of alignment or too close to each other. Orthodontists often use a device called a palatal expander to aid an under-sized jaw in its development. The device fits along the roof of the mouth between the teeth and applies gradual outward pressure on them. This encourages the jaw to widen as it grows, thus providing more room for erupting teeth to come in properly and decrease the chances of obstructive sleep apnea in the future. Reshaping and repositioning jaw bones. 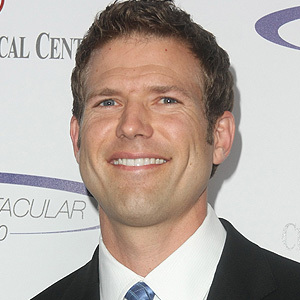 An overbite can occur when the jaws aren't properly aligned, often due to poor muscle and bone development. This is where devices like the Herbst appliance are useful. Its hinge mechanism encourages the lower jaw to grow further forward. The jaws can thus develop in a more normal way, minimizing the development of a malocclusion. Maintaining space. Primary ("baby") teeth are important for dental development because they help guide future permanent teeth to erupt properly; they also keep nearby teeth from drifting into the intended space. But when a primary tooth is lost prematurely due to disease or trauma, the space can become vulnerable to this kind of "drift." With a simple mechanism called a space maintainer we can hold open the space created by a prematurely lost primary tooth until the permanent tooth is ready to erupt. These and other techniques can help stop bad bites from developing in young children, minimizing or even eliminating the need for future orthodontic treatment. That means a healthier mouth for your child and less impact on your wallet. What prompted this wish? The fact that as a teenage basketball player, Stork received an elbow to the mouth that caused his two front teeth to be knocked out of place. The teeth were put back in position, but they soon became darker and began to hurt. Eventually, both were successfully restored with dental crowns. Still, it was a painful (and costly) injury — and one that could have been avoided. You might not realize it, but when it comes to dental injuries, basketball ranks among the riskier sports. Yet it’s far from the only one. In fact, according to the American Dental Association (ADA), there are some two dozen others — including baseball, hockey, surfing and bicycling — that carry a heightened risk of dental injury. Whenever you’re playing those sports, the ADA recommends you wear a high-quality mouth guard. Mouthguards have come a long way since they were introduced as protective equipment for boxers in the early 1900’s. Today, three different types are widely available: stock “off-the-shelf” types that come in just a few sizes; mouth-formed “boil-and-bite” types that you adapt to the general contours of your mouth; and custom-made high-quality mouthguards that are made just for you at the dental office. Of all three types, the dentist-made mouthguards are consistently found to be the most comfortable and best-fitting, and the ones that offer your teeth the greatest protection. What’s more, recent studies suggest that custom-fabricated mouthguards can provide an additional defense against concussion — in fact, they are twice as effective as the other types. That’s why you’ll see more and more professional athletes (and plenty of amateurs as well) sporting custom-made mouthguards at games and practices.